THESE SWEET AND STICKY RIBS ARE WORTH GETTING YOUR FINGERS DIRTY FOR! Feed your inner carnivore. Keep the napkins handy! Packed with the inspiring color photos â€œElectric Smoker Cookbook. 2 Manuscripts in 1 Book. Best Healthy Recipes of Smoking Meat for Real Pitmasters Eating Meatâ€ by Francis Wood provides everything you need to satisfy family and impress guests, including wood chip pairings, temperature guidelines and finishing techniques. Your electric smoker is the most convenient and affordable appliance for effortless, delicious barbecuing, and this book is its must-have manual. 2 Manuscripts in 1 Book! mouth-watering, juicy, tender meat recipes to feed your inner carnivore. 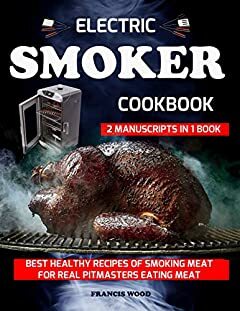 easy to prepare smoking meat recipes of chicken, turkey, pork, beef and lamb, beautifully laid out with gorgeous photography â€“ making them a joy to create! easy to follow directions and easy to find ingredients. ideal foodfor Carnivore diet, Meat Eating Diet with recipes for getting lean, ripped. Lose Fat Quick with these amazing, healthy meals that wonâ€™t kill your bikini bod. Score!! Put a little soul in your food!